While trying to organize my thoughts about the title of this blog entry, it becomes apparent to me that the potential of neurological transposition of electrical pulses is part of the function of the physical system in order to operate, while I am thinking something much different. It is the idea of our being receptive too something more then a signal transfer within the physical system of pathways established through repetitive use, but also the finding of that location, to receive.It is one where we can accept something into ourselves as information from another. As accepting information from around us. Information is energy? In the nervous system, a synapse is a junction that permits a neuron to pass an electrical or chemical signal to another cell. The word "synapse" comes from "synaptein", which Sir Charles Scott Sherrington and colleagues coined from the Greek "syn-" ("together") and "haptein" ("to clasp"). In a chemical synapse, the presynaptic neuron releases a chemical called a neurotransmitter that binds to receptors located in the postsynaptic cell, usually embedded in the plasma membrane. Binding of the neurotransmitter to a receptor can affect the postsynaptic cell in a wide variety of ways. When looking at Penrose's seminar and you have clicked on the image, the idea presented itself to me that if one was to seek "a method by determination" I might express color of gravity as a exchange in principle as if spooky action at a distance, as an expression of a representative example of colorimetric expressions. Here fuzzy logic and TA had served in principal to show orders between "O and 1" as potentials of connection between the source of exchange between those two individuals. I see "cryptography" as an example of this determination as a defined state of reductionism through that exchange. Stuart Kauffman raises his own philosophical ideas in "Beyond Einstein and Schrodinger? The Quantum Mechanics of Closed Quantum Systems" about such things, that lead to further ideas on his topic, has blocked my comments there, so I see no use in further participating and offering ideas for his efforts toward "data mining" with regard to his biological methods to determination. I can say it has sparked further interest in my own assessment of "seeking to understand color of gravity" as a method to determination, as a state of deduction orientation, that we might get from a self evidential result from exchange, as a "cause of determination" as to our futures. While I have listed here between two individuals these thoughts also act as "an antennae" toward a universal question of "what one asks shall in some form be answered." Not just a "blank slate" but one with something written on it. What design then predates physical expression, as if one could now define the human spirit and character, as the soul in constant expression through materiality? An "evolution of spirit" then making manifest our progressions, as leading from one position to another. 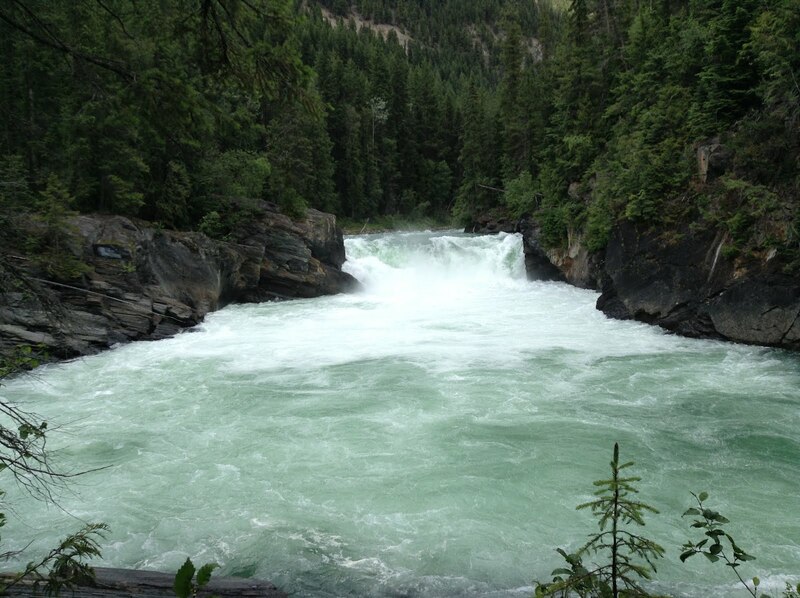 “We can say that the system definitely flows like a liquid,” says Harris. One of the first lead-ion collisions in the LHC as recorded by the ATLAS experiment on November 8, 2010. Image courtesy CERN. Scientists from the ALICE experiment at CERN’s Large Hadron Collider have publicly revealed the first measurements from the world’s highest energy heavy-ion collisions. In two papers posted today to the arXiv.org website, the collaboration describes two characteristics of the collisions: the number of particles produced from the most head-on collisions; and, for more glancing blows, the flow of the system of two colliding nuclei. Both measurements serve to rule out some theories about how the universe behaves at its most fundamental, despite being based on a relatively small number of collisions collected in the first few days of LHC running with lead-ion beams. It is appropriate that plectics refers to entanglement or the lack thereof, since entanglement is a key feature of the way complexity arises out of simplicity, making our subject worth studying. Forexample, all of us human beings and all the objects with which we deal are essentially bundles of simple quarks and electrons. If each of those particles had to be in its own independent state, we could not exist and neither could the other objects. It is the entanglement of the states of the particles that is responsible for matter as we know it. I wanted to refer to this article and have in previous entries. As of today, those current blog entries should have this new link as referenced. Will be correcting as blog entries appear. For the chemical analysis technique, see Gravimetric analysis. This gravity field was computed from sea-surface height measurements collected by the US Navy GEOSAT altimeter between March, 1985, and January, 1990. The high density GEOSAT Geodetic Mission data that lie south of 30 deg. S were declassified by the Navy in May of 1992 and contribute most of the fine-scale gravity information. The Antarctic continent itself is shaded in blue depending on the thickness of the ice sheet (blue shades in steps of 1000 m); light blue is shelf ice; gray lines are the major ice devides; pink spots are parts of the continent which are not covered by ice; gray areas have no data. Gravimetry is the measurement of the strength of a gravitational field. Gravimetry may be used when either the magnitude of gravitational field or the properties of matter responsible for its creation are of interest. The term gravimetry or gravimetric is also used in chemistry to define a class of analytical procedures, called gravimetric analysis relying upon weighing a sample of material. Gravity is usually measured in units of acceleration. In the SI system of units, the standard unit of acceleration is 1 metre per second squared (abbreviated as m/s2). Other units include the gal (sometimes known as a galileo, in either case with symbol Gal), which equals 1 centimetre per second squared, and the g (gn), equal to 9.80665 m/s2. The value of the gn approximately equals the acceleration due to gravity at the Earth's surface (although the actual acceleration g varies fractionally from place to place). An instrument used to measure gravity is known as a gravimeter, or gravitometer. Since general relativity regards the effects of gravity as indistinguishable from the effects of acceleration, gravimeters may be regarded as special purpose accelerometers. Many weighing scales may be regarded as simple gravimeters. In one common form, a spring is used to counteract the force of gravity pulling on an object. The change in length of the spring may be calibrated to the force required to balance the gravitational pull. The resulting measurement may be made in units of force (such as the newton), but is more commonly made in units of gals. More sophisticated gravimeters are used when precise measurements are needed. When measuring the Earth's gravitational field, measurements are made to the precision of microgals to find density variations in the rocks making up the Earth. Several types of gravimeters exist for making these measurements, including some that are essentially refined versions of the spring scale described above. These measurements are used to define gravity anomalies. Besides precision, also stability is an important property of a gravimeter, as it allows the monitoring of gravity changes. These changes can be the result of mass displacements inside the Earth, or of vertical movements of the Earth's crust on which measurements are being made: remember that gravity decreases 0.3 mGal for every metre of height. The study of gravity changes belongs to geodynamics. The majority of modern gravimeters use specially-designed quartz zero-length springs to support the test mass. Zero length springs do not follow Hooke's Law, instead they have a force proportional to their length. The special property of these springs is that the natural resonant period of oscillation of the spring-mass system can be made very long - approaching a thousand seconds. This detunes the test mass from most local vibration and mechanical noise, increasing the sensitivity and utility of the gravimeter. The springs are quartz so that magnetic and electric fields do not affect measurements. The test mass is sealed in an air-tight container so that tiny changes of barometric pressure from blowing wind and other weather do not change the buoyancy of the test mass in air. Spring gravimeters are, in practice, relative instruments which measure the difference in gravity between different locations. 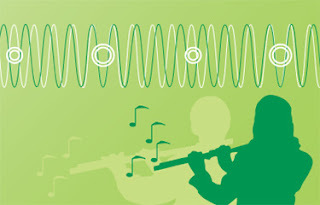 A relative instrument also requires calibration by comparing instrument readings taken at locations with known complete or absolute values of gravity. Absolute gravimeters provide such measurements by determining the gravitational acceleration of a test mass in vacuum. A test mass is allowed to fall freely inside a vacuum chamber and its position is measured with a laser interferometer and timed with an atomic clock. The laser wavelength is known to ±0.025 ppb and the clock is stable to ±0.03 ppb as well. Great care must be taken to minimize the effects of perturbing forces such as residual air resistance (even in vacuum) and magnetic forces. Such instruments are capable of an accuracy of a few parts per billion or 0.002 mGal and reference their measurement to atomic standards of length and time. Their primary use is for calibrating relative instruments, monitoring crustal deformation, and in geophysical studies requiring high accuracy and stability. However, absolute instruments are somewhat larger and significantly more expensive than relative spring gravimeters, and are thus relatively rare. Gravimeters have been designed to mount in vehicles, including aircraft, ships and submarines. These special gravimeters isolate acceleration from the movement of the vehicle, and subtract it from measurements. The acceleration of the vehicles is often hundreds or thousands of times stronger than the changes being measured. A gravimeter (the Lunar Surface Gravimeter) was also deployed on the surface of the moon during the Apollo 17 mission, but did not work due to a design error. A second device (the Traverse Gravimeter Experiment) functioned as anticipated. Microgravimetry is a rising and important branch developed on the foundation of classical gravimetry. Microgravity investigations are carried out in order to solve various problems of engineering geology, mainly location of voids and their monitoring. Very detailed measurements of high accuracy can indicate voids of any origin, provided the size and depth are large enough to produce gravity effect stronger than is the level of confidence of relevant gravity signal. The modern gravimeter was developed by Lucien LaCoste and Arnold Romberg in 1936. They also invented most subsequent refinements, including the ship-mounted gravimeter, in 1965, temperature-resistant instruments for deep boreholes, and lightweight hand-carried instruments. Most of their designs remain in use (2005) with refinements in data collection and data processing. While article is from Tuesday, June 22, 2010 9:00 PM it still amazes me how we see the moon in context of it's coloring. Topography when seen in context of landscape, how we measure aspects of the gravitational field supply us with a more realistic interpretation of the globe as a accurate picture of how that sphere(isostatic equilibrium) looks. Tidal forces between the moon and the Earth have slowed the moon' rotation so that one side of the moon always faces toward our planet. Though sometimes improperly referred to as the "dark side of the moon," it should correctly be referred to as the "far side of the moon" since it receives just as much sunlight as the side that faces us. The dark side of the moon should refer to whatever hemisphere isn't lit at a given time. Though several spacecraft have imaged the far side of the moon since then, LRO is providing new details about the entire half of the moon that is obscured from Earth. The lunar far side is rougher and has many more craters than the near side, so quite a few of the most fascinating lunar features are located there, including one of the largest known impact craters in the solar system, the South Pole-Aitken Basin. 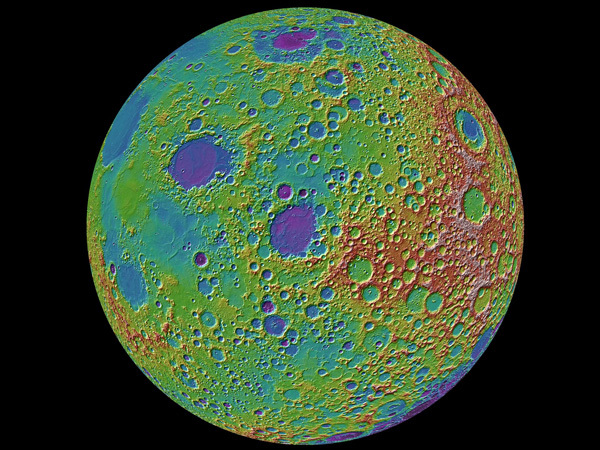 The image highlighted here shows the moon's topography from LRO's LOLA instruments with the highest elevations up above 20,000 feet in red and the lowest areas down below -20,000 feet in blue. Figure 4: A lunar topographic map showing the Moon from the vantage point of the eastern limb. On the left side of the Moon seen in this view is part of the familiar part of the Moon observed from Earth (the eastern part of the nearside). In the middle left-most part of the globe is Mare Tranquillitatis (light blue) the site of the Apollo 11 landing, and above this an oval-appearing region (Mare Serenitatis; dark blue) the site of the Apollo 17 landing. Most of the dark blue areas are lunar maria, low lying regions composed of volcanic lava flows that formed after the heavily cratered lunar highlands (and are thus much less cratered). 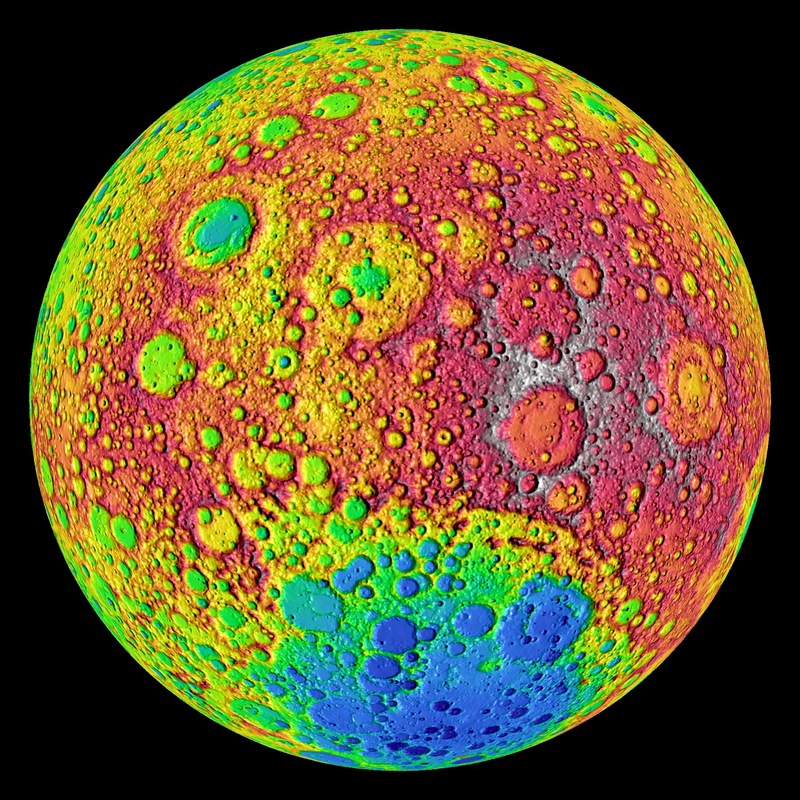 The topography is derived from over 2.4 billion shots made by the Lunar Orbiter Laser Altimeter (LOLA) instrument on board the NASA Lunar Reconnaissance Orbiter. The large near-circular basins show the effects of the early impacts on early planetary crusts in the inner solar system, including the Earth. Radial gravitational anomaly at the surface of the Moon as determined from the gravity model LP150Q. The contribution due to the rotational flattening has been removed for clarity, and positive anomalies correspond to an increase in magnitude of the gravitational acceleration. Data are presented in two Lambert azimuthal equal area projections. The major characteristic of the Moon's gravitational field is the presence of mascons, which are large positive gravity anomalies associated with some of the giant impact basins. These anomalies greatly influence the orbit of spacecraft about the Moon, and an accurate gravitational model is necessary in the planning of both manned and unmanned missions. They were initially discovered by the analysis of Lunar Orbiter tracking data, since navigation tests prior to the Apollo program experienced positioning errors much larger than mission specifications. Netherworld is often used as a synonym for Underworld. Okay this may seem like a strange title, but believe me when I say how fascinating that such dynamics in meeting "each other: will allow something to "pop" right out of existence. Underworld is a region in some religions and in mythologies which is thought to be under the surface of the earth. It could be a place where the souls of the recently departed go, and, in some traditions, it is identified with Hell or the realm of death. In other traditions, however, such as animistic traditions, it could be seen as the place where life appears to have originated from (such as plant life, water, etc.) and a place to which life must return at life's end, with no negative undertones. I mean I am not quite sure how this post must materialize, to conclude "non-existence" until it is clear, that such dynamics will allow such a thing to happen, that one could say indeed, they have completed their journey. To solidify this until understanding, I relived these things until I saw the last of the tension ebb away to allow "a tension" to become undone. As if such tension "had to exist" until the very bubble that harbored and allowed all of the world of our expediency no longer supported such a viable option as that bubble. I know this is not such a cute analogy but to get to the essence of the story then it has to be understood that underneath "this experience" is a dynamcial revelation of sorts that hides the equation of such an experience? You should know then that I see this very schematics of the world as having this nature to it that we may describe reality as something closer to the definition of it's very existence and that such a attempt at describing nature was to get to the very end of what begins? Imagine arriving at the juxtaposition of such a point? How are We to Contained Experience? By adding a fourth dimension to the three dimensional space, the self-intersection can be eliminated. Gently push a piece of the tube containing the intersection out of the original three dimensional space. A useful analogy is to consider a self-intersecting curve on the plane; self-intersections can be eliminated by lifting one strand off the plane. This immersion is useful for visualizing many properties of the Klein bottle. For example, the Klein bottle has no boundary, where the surface stops abruptly, and it is non-orientable, as reflected in the one-sidedness of the immersion. The geometry was revealing as I tried to encapsulate this point, so as to see where such a description fell away from all that we can contain of the world. That we can truly say we had indeed let go. To imagine then that one's grip on things became ever tighter, while wishing to let the strength of this while becoming ever stronger to fall away. "While Gassner was watching television, the natural motion of the Earth must have carried him through a small non-orientable pocket of the universe," said Boris Harkov, a mathematician at the Massachusetts Institute of Technology in Cambridge. "That's the only reasonable explanation." Ultimate realization that what is negative is a positive toward completion.That is how one might define the whole perspective of validation of no longer being negative? 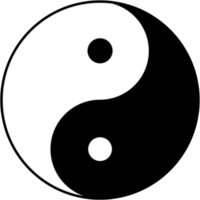 As if one wold realize that such a tension revealed in the Tao, no longer existed in the picture as a demonstration of the Tao now gone. Now, such a object seemed part of the experience, as to the unfolding, yet in my inadequate understanding how could such a thing be taken down to such a point as to say it no longer existed. How can I say say such a geometry was part of that process while I struggle to define such an action as falling away or reducing it to such a point of nothing? It's enough then that one sees "around that point" that the ultimate quest envisions such an "undoing" that we see where the relevance of such a tension can and should no longer exist? The Experience Most Fitting then ? As I relayed earlier I experience many things until I understood this undoing, that such reason then to awareness of "what should be" was capsulized in only one example. How shall I say it then that I understood all that befell me to dissolution to show that such a demonstration was complete. I would still be here? That such an equation of resistance could have been imparted not only in the equation, but in the telling of the experience too? While I show by experience such an example it should be taken that in this example I have changed the name of the person in order to protect our association. Shall I be so forthcoming that only the "object of relation" shall be the only thing identifiable so as to know that this association is very real to me, and only to me by that person's identification as an experience that is real? Aw....well anyway "more then one" for sure, as to the way in which I use that experience to demonstrate. It all began, as I noticed a tension in his voice, as he slipped into the realization of something that had happen to him earlier in that day. I was taken to a "good observation point" so that I might admit to seeing what he was seeing. As hard as I looked at first I could not tell what he was so upset about that I tried ever harder to see, that slowly I understood then what he was pointing at. Why such a tension could exist in him and his voice, that such a rectification and adjustment was needed in order to make this right. As I relay this situation it was apparent at the time of such a demonstration, as to a example that this situation popped up, as such a reason to be demonstrated that to make it right, had to be the undoing of what made it wrong you see. To make the point ever driven home for realization was to demonstrate that such undoing had to rectify the situation of where it began, so of course, all actions taken to get it fixed. Could it have ever been undone? Well as if I understood why such an experience came frothing to the surface of awareness I thought to conclude this example by what I saw, that it took me by realization that "in turning" to back up, a hand imprint in oil was left on the back of the seat in order for the person to complete the job. A "new point of tension" by not washing their hands, or not covering pristine upholstery that was just purchased, was created. All of this has to be undone in order for one to say that this experience has popped out of existence you see? That was how such a demonstration was shown to be reasonable in my mind for such an equation to manifest such a description about that experience that I could say that it was reasonable to me that I had understood. Was it a good example rests on you to be sure. He was elected a Fellow of the Royal Society in 1977. In 1986 he was awarded the Darwin Medal. He also developed and recovered from colon cancer. ^ Benton, Michael (2009). "Paleontology and the History of Life". In Michael Ruse & Joseph Travis. Evolution: The First Four Billion Years. Cambridge, Massachusetts: The Belknap Press of Harvard University Press. pp. 80–104. ISBN 978-0-674-03175-3. We know that colour is a psychophysical experience of an observer which changes from observer to observer and is therefore impossible to replicate absolutely. 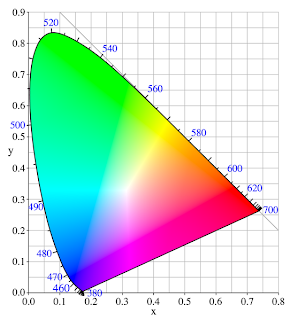 In order to quantify colour in meaningful terms we must be able to measure or represent the three attributes that together give a model of colour perception. i.e. light, object and the eye. All these attributes have been standardised by the CIE or Commission Internationale de l'Eclairage. The colours of the clothes we wear and the textiles we use in our homes must be monitored to ensure that they are correct and consistent. A sensible reductionist perspective would be something like “objects are completely defined by the states of their components.” The dialogue uses elephants as examples of complex objects, so Rosenberg imagines that we know the state (position and momentum etc.) of every single particle in an elephant. Now we consider another collection of particles, far away, in exactly the same state as the ones in the elephant. Is there any sense in which that new collection is not precisely the same kind of elephant as the original? Most know the "general area" we are talking about, and since Quantum gravity rests on a lot of minds, we have to see methods of materiality as measure in which to express that reality? So what are the ways in which modern day theorists and scientists detest the insight that such designs are inherent in the very symmetrical views with which all symmetry breaking phases can materialize? Do they? "If you constraint the idea of the elephant as a picture of the quantum gravity regime then it is highly likely one would seek to use that elephant in thought experiments to progress such thinking about possible methods to describing that determination within that given environment? How many methods? One, and only one blind man's description in hand? :) It's still a elephant:)"